As the summer reaches its end, an Italian region that is not complaining about a bad season is Puglia. Thanks to the weather, beautiful beaches and unique food, Puglia can say that it is loved by Italians and foreigners alike. The organization called Spot (Sistema Puglia per l’Osservatorio Turistico), a local regional agency recording tourism affluence, reports that tourism has increased considerably. Puglia is a region little known to Americans but one well worth discovering for the gourmet traveler. Its sunny location provides the ideal conditions for the cultivation of flavorful fruits, vegetables and viticulture. 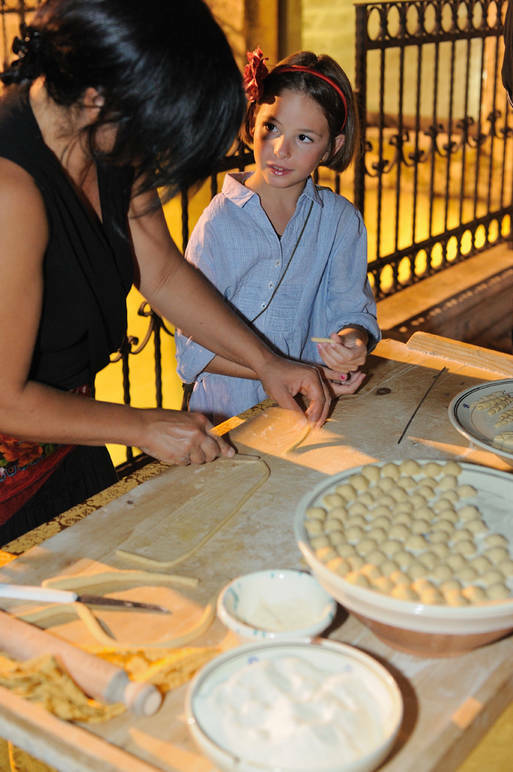 Apulian cuisine is healthy, based on homemade pastas and cheeses, fresh vegetables, seafood and local olive oil. The cuisine from Salento, an area in the south-eastern extremity of the region, is characterized by a wide range of vegetables, main ingredients of the local traditional diet: cima di rapa (broccoli raabe), cabbage, thistle, peppers, eggplant, artichokes, all types of legumes, from beans, to chickpeas, peas and fava beans. Author Micol Negrin writes in her award winning book Rustico: Regional Italian Country Cooking: “The Apulians are avowed vegetable addicts. They even have a saying ‘of all vegetables, the fava is queen, cooked in the evening, warmed in the morning.’ Every year in Puglia 33 million pounds of fava beans are harvested and transformed into antipasti, side dishes, and soups.” The traditional country dish par excellence is a puree of fava beans served with sautéed wild chicory called ‘ncapriata. In addition to these, a lot of wild vegetables are widely used: we are talking about chicory, asparagus, paparine (poppy plants before the flower blooms), ripili, also known as finocchietto marino (plants that grow on wet sea rocks) and the famous lampascioni (bitter wild onions). “In lean times, the ability to turn a handful of field greens into a meal surely came in handy; today, it forms the basis for a unique cuisine,” writes Negrin. Vegetables and legumes are mostly consumed with bread or pasta, both preferably home-made. 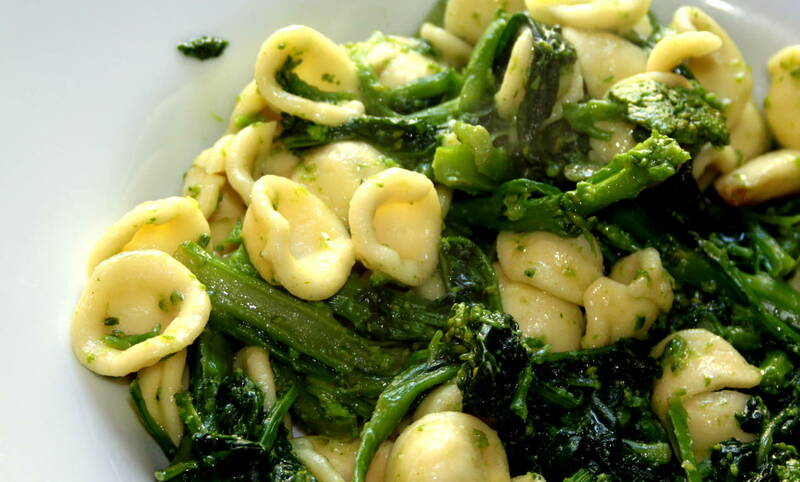 Among the most famous dishes we then find orecchiette (ear shaped pasta) with broccoli raabe, ciceri e tria, pasta with chickpeas, and minestra maritata, a vegetable and legume soup with bread and pecorino cheese. Back in time, meat was considered a luxury, so it doesn’t really appear much in Apulian menus, except in dishes that through the years have been re-adapted by the local cooks – so ground beef is mixed with bread for flavorful meatballs; horse meat, which was cheaper, is served stewed and in other variations, such as in pieces with tomato sauce. Lamb is also loved and a classic recipe is called turcinieddhi (lamb meat rolls stuffed with innards). The sea, of course, provides tons of fish, seafood and crustaceans, that are unbelievably fresh and delicious. Among the most known fish based dishes we find purpu alla pignatta (octopus cooked in a terracotta pot with onions and tomato), scapece, the word derives from the Spanish and can be applied to any dish, usually fish, marinated in a sweet-and-sour sauce, pupiddhi fritti, fried fish, tajeddha (baked rice with potatoes and cockles), and pasta with sea urchin. The production of cured meats never really took off because of the warm climate and the lack of means to age the meat properly. Proteins found their way into the local diet through cheeses, cheeses that are simply amazing now as they were back in time. These are ricotta, giuncata, fresh cow milk cheese, cacioricotta, salted ricotta that is shaved over pasta, ricotta forte, fermented ricotta, with a very strong taste, scamorza, and aged pecorino. Bread deserves its own paragraph as it is simply unique and amazing – made with different ingredients and in numerous shapes. Writer Carole Kotkin of TravelLady Magazine talks about bread this way – “Bread in Apulia is given almost reverential treatment. If a piece of bread is dropped on the floor, peasant people will pick it up immediately, kiss it, and return it to the table for eating. Apulian bread is not made with commercial yeast, but from yeast produced in households that has been in use for generations. Dough made with this yeast is slower to rise than that made with commercial yeast and has a chance to develop a better flavor.” Carol Field, author of The Italian Baker remakred "The tastes and shapes of Italian breads are fragrant reminders of a tradition of baking that is older than the Roman monuments and Romanesque cathedrals that we rush to Europe to see." Altamura bread is possibly Italy's best bread: “large heavy wheels with burnished brown crusts baked in a 300 year-old oak wood-fired oven from centuries-old sourdough starter," but this town is not in Salento but on the Murge plateau in the province of Bari. Among other baked specialties we find frisella, a traditional hard barley bread, the size of a donut that is dipped in water to soften and then seasoned with olive oil, salt and tomatoes, and taralli, a snack food, also doughnut shaped but about 3 inches across. Taralli can be either somewhat sweet or slightly salty, and some people sprinkle their surfaces with anise seed, pepper, or whatever. 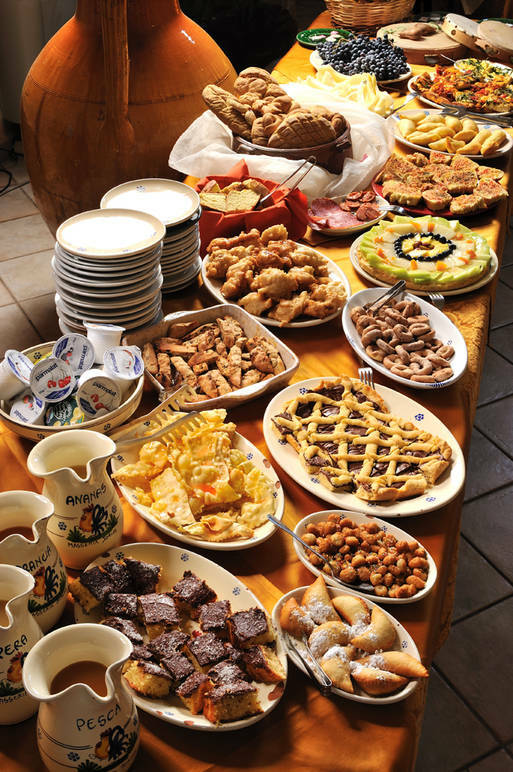 The most common desserts from Salento are cakes and pastry made of ground almonds; cartellate are ribbons of pastry twisted into circles and covered with either honey or mulled wine; pittule (or pettole) are small balls of pastry fried in olive oil (eaten at Christmas or Easter), diavulacce are made with almonds and coco, dried figs dressed with toasted almonds, sometimes coated with chocolate and quince jam. In Salento, a traditional meal could begin with eggplant stuffed with Pecorino, or raw cocomeri, short and fat cucumbers believed to prepare the stomach for the upcoming meal. First course choices might include fava bean puree with sautéed chicory and olive oil, or a nice plate of orecchiette or other home-made pasta such as frusciuddati, short, hand rolled cylinders. The menu would then include lamb or kid roasted in a wood oven or fresh fish such as braised cod with tangy black olives from local trees. Cheese and dessert would finish off the meal…for whoever still has an appetite!